Camilo Duque, Jr., Assistant Vice President-Branch Manager (pictured right) and Michael Yao, Vice President-Senior Commercial Banking Officer (pictured left) presented Linda Autore, President and CEO of Laurel House, Inc. and Gregg Pauletti, Thinking Well and Supported Education Manager, with a $7,500 grant from the First County Bank Foundation for their Thinking Well program. 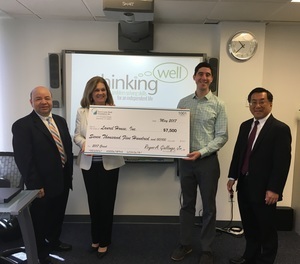 On Monday, June 26, Michael Yao, Vice President-Senior Commercial Banking Officer, and Camilo Duque, Jr., Assistant Vice President-Branch Manager, presented Linda Autore, President and CEO of Laurel House, Inc. and Gregg Pauletti, Thinking Well and Supported Education Manager, with a $7,500 grant from the First County Bank Foundation. The grant will be used for Laurel House’s Thinking Well (Cognitive Remediation) program, a privately funded program that addresses the long term cognitive impairment of those living with serious mental illness. Thinking Well removes barriers to employment, education and independent living, facilitating increased self-sufficiency and improved economic opportunity.